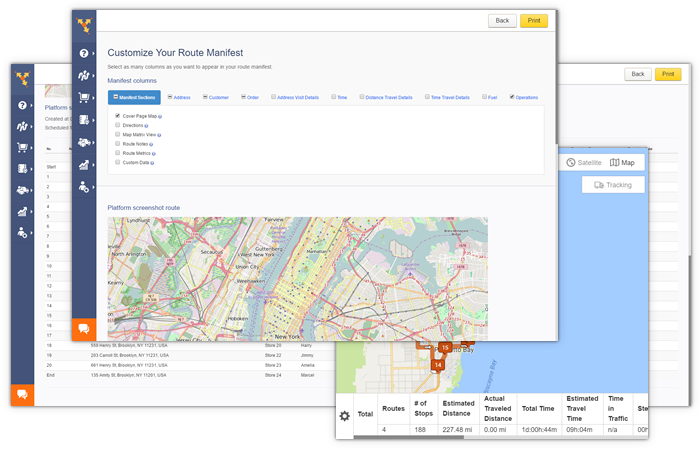 Route4Me automatically generates a manifest for every route created. These manifests have over 60 customizable attributes, several of which will tell you the estimated time and distance of the route. Tons of factors can affect estimated travel time - day of the week, time of the day, weather and temperature, the types of items being loaded and unloaded, the types of services performed at each location, some guy deciding his hands are better placed on a Big Mac than the steering wheel causing a massive pileup on the interstate, etc. Route4Me accounts for all of that and more. Your manifest will reflect the current position of your driver on the route and the traffic conditions for each stop on the route. Drivers have long used the excuse of bad traffic to explain why packages arrived late - now, you’ll know when they’re telling the truth and when they’re actually using company time to make some personal stops. Many companies use Route4Me as their central transport management system. Because of this, the same traffic manifest can be used to notify customers about a driver’s status, show dispatchers route delays, and help you with many other operational scenarios.